ANDY OnCall ® makes projects, repairs & maintenance easy & hassle free. When you need a home repair, simply contact ANDY OnCall ®, and we will send a skilled craftsman for a FREE Estimate. It’s hard to believe, but summer is almost here. There are plenty of easy home improvement projects you can take on that will increase your home’s value, make it look better, and get things ready for the upcoming fall and winter seasons. Summer is a great time to work on your home because the weather is warm, which makes doing most of these chores a breeze. You can finish some of these projects in less than an hour, while others will require a bigger time commitment, depending on your home’s features. Start at the top of the list for the easier, quicker fixes and work your way down. Clean the gutters. If your home sits under a pollinating tree, then your gutters might have brown or yellow stains dripping down the sides from the spring’s pollination cycle. But even if it doesn’t, leaves may have accumulated, which not only clog gutters, but can cause stains as well. Now is a great time to scrub your gutters down because the weather is warm and they’ll stay relatively clean until the fall. Clean exterior lights. Have you ever cleaned out the dead bugs from your home’s exterior lights? Many people don’t think to do this, but those bugs add up. They not only look gross, but they also dim the quality of the light. This is an easy chore that will give your home a bright, clean look. Fix concrete cracks. If you have a concrete driveway, patio, or path, you know that the winter months can be brutal on these areas. The constant freezing and melting, as well as the salt you throw down, all contribute to cracks. If left unattended, these cracks will get wider with each successive winter season. If the crack is small, buy concrete caulk. Simply clean out the crack (a pressure washer works great for this) and apply the caulk. If the crack is large, then you’ll need to apply concrete patch. Caulk the exterior. Caulk not only helps protect the exterior of your home from the elements, but it also helps keep it air-tight, which means lower monthly utility bills for you. Exterior caulking should be done once per year. And you sure don’t want to do this outdoor project during the dead of winter or during a wet fall or spring. Start caulking around windows and doors first. If your home has a wooden exterior, use clear caulk between any slats that are separating or open. Clean and Seal Your Deck. Decks get dirty. Give your deck a good scrubbing with a stiff brush and soap or use a power-washer. Then, apply a fresh coat of sealer to protect the wood from rain and next winter’s snow. Not only will this keep your deck in good repair for years to come, but it looks great too! Clean Up Outdoor Furniture. Are your Adirondack chairs looking faded and sad? Is your patio furniture coated in dust and grime? Clean your furniture from top to bottom. If the material can be painted or stained, why not add a fresh coat? Painting outdoor furniture can be a great project to do with your kids, too. Just be sure to use a low-VOC or nontoxic paint. Add an Outdoor Fireplace. If you’ve been dreaming about summer nights in front of an outdoor fireplace, now’s the time to make it happen. Create a safe space in your yard for a fire pit; it shouldn’t be close to overhanging trees and should be at least 15 feet from the house. Dig into the ground to form a circle three feet in diameter. Pour sand in the bottom, and then surround it with a metal fire pit ring, which can be purchased inexpensively from any home improvement store. Once you’ve gathered some wood, you’re good to go! Summer is a great time to do a lot of things – especially in regards to home improvement and they can add loads of value—both visually and financially – to your home. 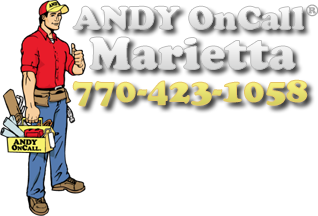 Whatever your summer home improvement project, ANDY ONCALL ® is here to help! Remember three important words: TURN IT OFF. Don’t leave the video game on pause, or the computer in sleep mode. Those electronics are still using energy, even when you aren’t using them. Turn your water heater down to 120 degrees Fahrenheit to save money on your electricity bill. If you have children in the house, this is also a safety measure. Postpone laundry and dishwashing until nighttime to avoid generating extra heat in your home. Also, consider taking advantage of the warmer air and dry your laundry outside. Close blinds, drapes and shades during the hottest part of the day. This keeps the strong sunlight from heating your home. Consider installing a ceiling fan. During hot weather a ceiling fan will create a cool breeze and keep the air circulating in your home. Set your thermostat to 78 degrees when you are home and 85 degrees when you are away. Always take into account health considerations and be sure to drink plenty of fluids in warm weather. Consider installing a programmable thermostat because it can save up to $100 a year in energy costs.